my little red suitcase: coffee and crochet and a loopy lou! coffee and crochet and a loopy lou! 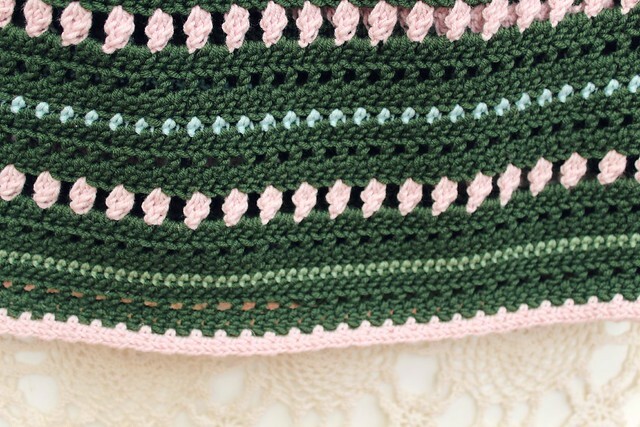 I think February is looking like being a coffee and crochet month! Since I started last months 30 day craftathon, finished items are just flying off my hook. My shop is starting to fill up again. I am wading through what needs to be finished and just looking out for some brighter days to photograph things. There is one thing that has been waiting so patiently for me to show you. It actually all began in here, all the way back in May last year, on a day out in Bristol. I had travelled up on the train with my son and he had gone to meet friends for the day. I was wondering around the quite new to me city, looking for a pit stop and somewhere to sit and cast on my new project. 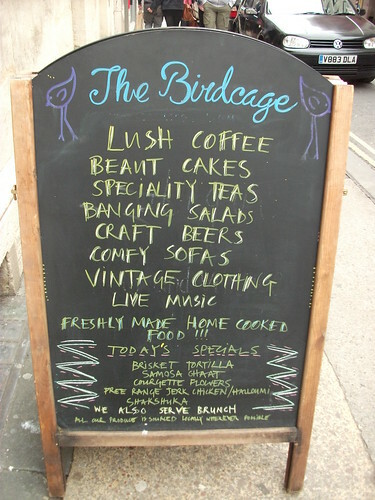 This sign in the city center called me in, I liked the sound of the 'lush coffee' the 'banging salads' and the comfy sofas! The vintage decoration inside ticked all the right boxes, it was vibey, full of students, vintage clothes were for sale. I was served by a guy wearing baggy jeans, a jumper from the eighties and the kind of curly hair do which left me thinking he might have been my boyfriend from 1986!.... I love the way vintage now includes the 1980's as well. I choose the dark green because I had quite a large amount of green merino wool to use up, and then I added in the softer colours. I decided to make the poncho longer so I kept on going, and going. It's just right with jeans and boots, which is just as well because that's all I wear! I decided to finish with a simple edge rather than the 'loops', which makes it rather less loopy. It was a hugely satisfying longer project, which spanned over about 6 months. The merino wool is soft and warm, and I think hung in such a way that it doesn't need blocking. I also added a little label in the back so I know which is the reverse. So thank you Sandra@Cherryheart for your pattern! 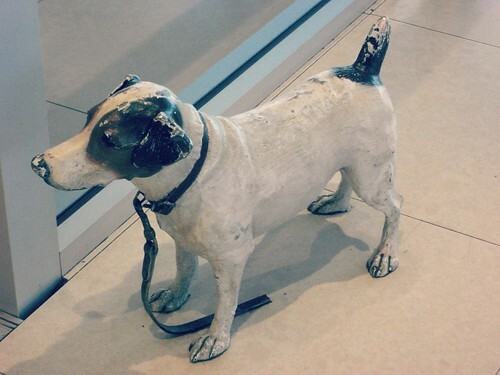 And this was a little dog I saw that day, as I peeped in the doorway of At-Bristol. beacause I had to leave mine at home! 80's vintage...I remember when the 80's were awesome! 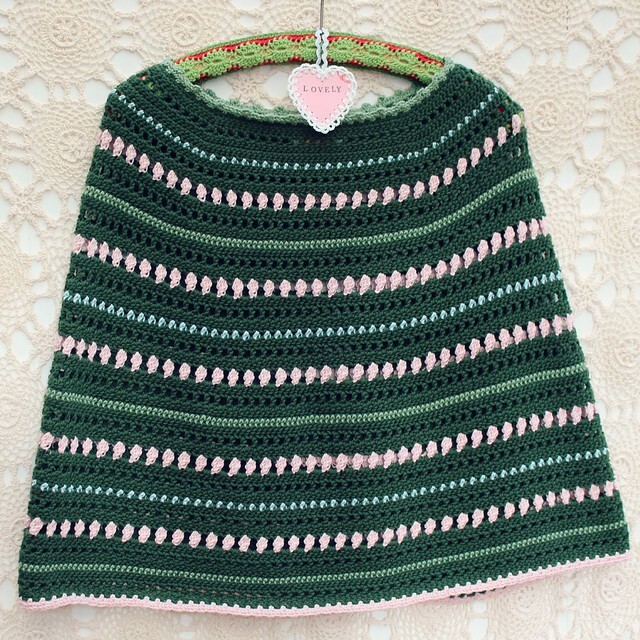 I love the colors you chose for your poncho and the cute little tag finishes it off nicely. 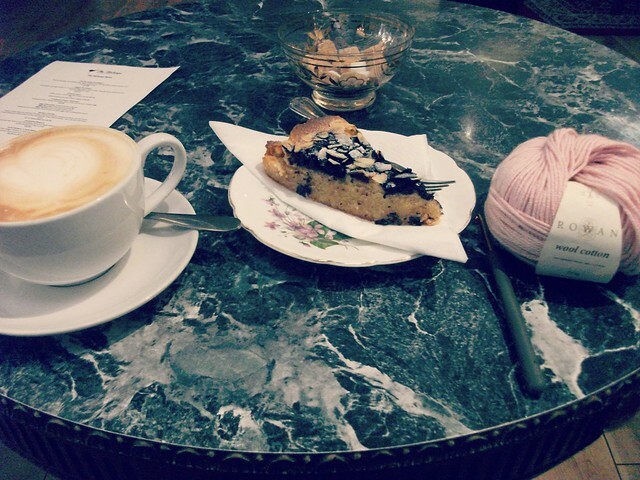 I hope your February is full of coffee and crochet! Have a great day! Not sure if the café would appeal if 80s is in, but…! 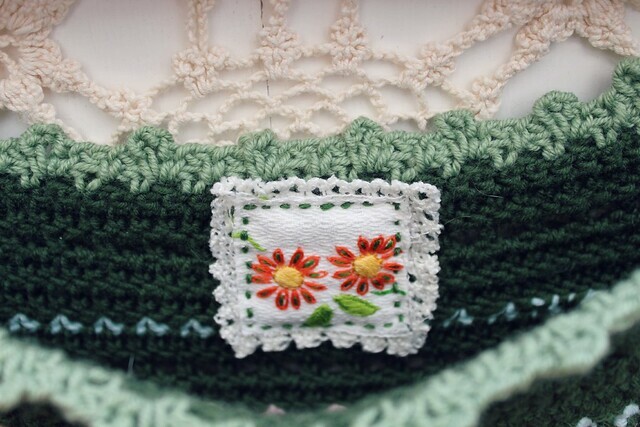 I don't normally much like the look of crochet (being a knitter and all) but this is really attractive; definitely like! I'd love to know where in Bristol the cafe is. I was a teenager in the 80s and the DM boot revival on today's teen girls makes me very nostalgic. I adore the colour of the shawl too. What a great place to go for a coffee. It's beautiful! I love your colours choices so much and that label is just perfection too. 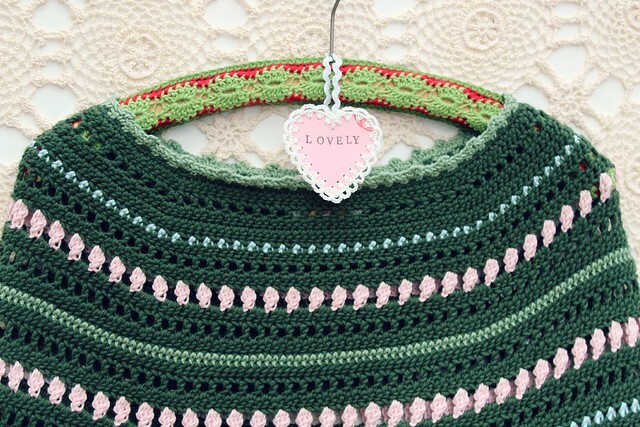 your colour choices for the poncho are gorgeous & the handmade label just made it perfect! This looks gorgeous, love the colour combinations. The pit stop reminds me of a similar one in Peterborough. 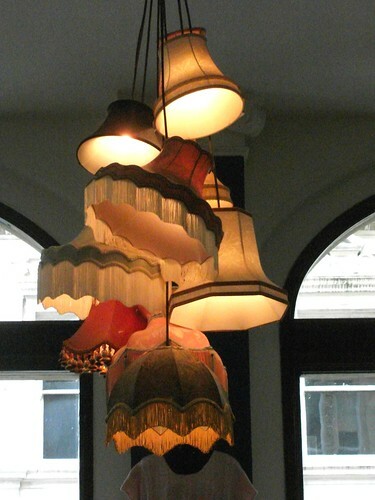 They have the same idea with the lampshades and it fascinates me! Have a great weekend! Mmm, I just discovered I missed a couple of your latest blogs, including this one! Somehow the didn't show up in my google-feed. I'm going to catch up right away! ;-) Love your poncho, very pretty!